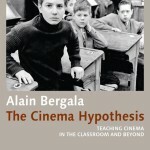 To celebrate the English translation of Alain Bergala’s The Cinema Hypothesis, the BFI are hosting a discussion event on Friday 03 February 2017, 2-5pm, at BFI Southbank. Join Alain Bergala, Professors Andrew Burn (UCL Institute of Education) and Katren Lury (Glasgow University), and Alejandro Bachmann (Austrian Film Museum) to discuss the English translation of Alain Bergala’s L’Hypothèse Cinéma. First published in 2003, The Cinema Hypothesis is at once an outline of a philosophy of film education, a memoir of a ‘childhood in cinema’, a cultural history of film policy in France, and a practical guide to engaging young people in cinema.